1- Hizb ut Tahrir is a political party whose ideology is Islam and politics is its works. It works among the Ummah and with it in public. Its work is not hidden to anyone. It has been working for more than 66 years in more than 40 countries around the world. How can a false report connect its members, especially the head of the Media Office, to assassinations and chaos activities? This flimsy report cannot mislead the Ummah that knows the party, its men and its method. 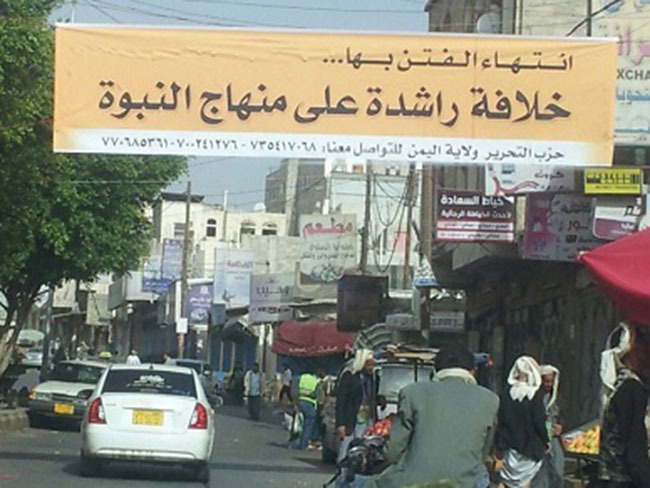 Many people in Yemen, whether at the level of individuals or parties and activities, know the truth of Hizb ut Tahrir; many of the Hizb’s members visited many of them carrying its call, and have already addressed them through seminars,press conferences and public speeches or through the delivery of leaflets to them and the direct contact with them. Many of them were surprised by the report and the false claims in it about the members of Hizb ut Tahrir. The party does not work in the dark but it works in the Ummah and with it, challenging and defiant by its call, calling on the Ummah to work with it to restore the rule of Islam and its authority, exposing to it the plots of the Kafir occupation against it and their tools: the agent oppressive warring rulers. This is what disturbs them and gives them sleepless nights. They seriously take into account every leaflet distributed by the party or a statement it publishes. They realize that the power of the idea is more powerful than the strikes of weapons. The oppressive rulers are dreaming if they think they can prevent an idea that its time has come. 2- There is no truth to what is stated in this report; that the head of the Media Office of the party in Yemen is the leader of a group called (the youth group of the Islamic Khilafah (Caliphate) in the city of Taiz!! The fallacies and fabrications of the report’s writer and the malicious accusations and narrow partisan plots and abhorrent subordination have blinded the report’s writer from the truth; no wonder, the report’s writer is a servant to his masters, the kafir colonists, and a spy to the Kufr nations and the United Nations hateful to Islam and Muslims. The details of the report will not mislead the general public of Yemen who know the truth of the United Nations and its false reports that take the standard of its master America, that dominants the world. 3- The report ignored the official status of Brother Abdel M’umin Az-Zaila’i as the head of the Media Office of Hizb ut Tahrir in Wilayah of Yemen. The report gave him a non-existent status! This report has been fabricated with clear malice scheming; all for the purpose of misleading, obscuring and confusing the people of Yemen. If the report mentions his status in the party, then the truth would become clear to all who know the reality of the party and its method to achieve its objective. It is a political party that does not bear arms, nor does it carry out the actions mentioned in the report; it is not out of fear, but in adherence to the Shariah method of establishing the Khilafah Rashida (rightly guided Caliphate) on the method of the Prophethood. 4- Hizb ut Tahrir does not adopt in its method to achieve its goals any material acts and does not have wings or armed militias like other parties whose hands are contaminated with the blood of the people of Yemen by fighting each other. It does not adopt the carrying of arms in its method of change no matter what injustice and hardship it faces. It does not carry out assassinations and bombings, but it considers terrorizing, arresting, torturing and killing unjustly of Muslims a crime; it is a political party based on Islam and is committed to the method of Prophet Muhammad ﷺ in the establishment of the first Islamic state. And it condemns these crimes and assassinations and has issued statements and leaflets revealing the truth of those who stand behind the local parties of the conflict or the regional or international ones and what these dirty crimes aim at. 5- Hizb ut Tahrir has expressed its position on the conflict in Yemen, explaining to the Muslims and the people of Yemen the truth of the conflict that ignited the war in Yemen and how it burnt Yemen; it explained that it is not in the interest of Islam and Muslims in anyway. Hizb ut Tahrir has explained that the conflict in Yemen is an international conflict led by the United States and Britain; the two colonial countries which are competing for influence and wealth in it through their tools, the agents, whether local or regional, and those who want more information can refer to what was issued by Hizb ut Tahrir at the time and what is written in its pages and official websites. Alhamdulilah that many people of Yemen began to see the truth of this conflict in this country which has been ravaged by malignant colonial conflicts. 6- By Allah’s will, Hizb ut Tahrir and its members will not be dissuaded by the accusations, nor the rumors of the corrupt, nor the prisons of the oppressors, nor the reports of the Kufr nations and will not stop moving forward in this way, in which we are working with the Ummah to achieve its revival and restore its authority and work to restore Islam to the reality of life by establishing the Khilafah Rashida on the method of Prophethood. Allah is the Supporter of the believers; He is the best Supporter and Helper; and the party and its members will remain proclaiming the truth and as a thorn in the throat of all Kuffar and agents.